The science debate is getting “hot” and NAS members my not be able to avoid the battle. Thank you, Professor Curry, for having the courage to post the video about student intolerance at Brown University. They are not alone. The head of Physics and Astronomy at University College London reportedly requested organizers to move the London GeoEthics Conference on Global Climate Change off campus. Politics and Science entries for this week and not one mention of John Kerry calling air conditioning a bigger threat than ISIS? Maybe my FIND feature isn’t working right. The sea level animation looks great. Unfortunately, it then drops you into one of Dr. James Hansen’s monologues. I wonder if this a fair use of NASA’s materials. It is a nice animation, but some times all the sea is high and some times all the sea is low. How can that happen. We are told the sea can rise dramatic, but the next month it is all gone again. The Earth has normally two high tides and two low tides at the same time spread around the globe. I wonder what it shows. Taking advantage of the many selective ‘outrages’ that Westerns are known to indulge –beyond all reason and self-interest– is what has the ‘progressives’ using the supposed plight of polar bears to promulgate its global warming meme; what about the camelids? Peru’s government has declared a state of emergency in the southern Andes and promised $3 million in relief amid a bitter cold snap that has killed 50,000 alpacas. Authorities fear that if the mercury continues to hit minus 9 Fahrenheit (minus 23 Celsius) as many as 300,000 camelids could die, devastating the largely indigenous families who raise them. And I imagine that if 50,000 caribou were to die because of an el Nino inspired warm spell you would be just as dismissive. Dismissive of what? Last year 200,000 Alpaca died in a Peru cold snap. I think it’s very important to get out front and blame natural variability… the BOM meteorologist say El Niño can do this, and apparently even a Nada El Niño can do it. The key thing is to make certain ACO2 didn’t do it, and I think I’ve done a Masstaful job. California Drought, Marine Heat More Likely With Warming – or maybe without it as well. Many years ago a fish hatchery biologist told me that in the past salmon disappeared from Sacramento river watershed four times at least, probably because of drought and heat. WUWT has the original Legates piece on teaching advocacy instead of science, plus a lengthy discussion (including comments by me): https://wattsupwiththat.com/2016/07/22/climate-science-or-climate-advocacy/. One topic of interest was science education in early years, including kindergarten. People seemed to know little about it so I posted the lengthy Virginia Science Standards that specify what should be learned in kindergarten. There is a great deal indeed, as there is in every K-12 grade, in most States. We really need to develop climate debate teaching materials that speak to the specifics of the Standards, on a grade level basis. See: https://wattsupwiththat.com/2016/07/22/climate-science-or-climate-advocacy/comment-page-1/#comment-2263178 for the kindergarten level Science Standards of Learning. That’s why kindergarten will soon be mandatory. ISIS uses the same approach. That’s why kindergarten will soon be mandatory. In Raqqah and Mosul they use the same approach to raise a new generation of holy warriors. The Arctic Ocean opened during the Medieval Warm Period. The Vikings moved to Greenland. The Chinese mapped the Arctic. The Arctic was mostly open for several hundred years while increased snowfall replenished the ice on Greenland and the Mountain glaciers. You can see the increased ice rate in the ice cores. There are the ice core records that show it happened. Then the more ice spread and cooled the earth into the Little Ice Age. That natural, necessary, replenishing ice cycle is underway again. The Arctic will close again in a few hundred years, after there is enough ice on land to cause the next natural, necessary, Little Ice Age. By mostly open Arctic, I mean, mostly open in September, as it is now. Not year round, that will not happen. The replenishing snowfall has started, it will limit the upper bound of temperature. Earth will not cool much until the increased volume of ice on land starts advancing faster than it is melting and retreating. Ice core data shows this to be the natural repeating cycle. In the Medieval Warm Period which the climate change industry pretty much claim wasn´t significant? Excellent book. I read it several years ago before my interest in AGW. Will now reread it. This is spooky. I bought the book just today in our local second hand book shop for 3 pounds. Provided I return it undamaged I will get half of this back.! I was hugely sceptical of his book when it first came out some years ago and had a number of email conversations with the author asking for his evidence but he refused to release it. There are a number of web sites detailing objections to the authors case. I shall reread the book having made a number of visits to the Scott polar institute in Cambridge in recent years Where I saw evidence of various periods of arctic warming. I suspect the northeast passage probably opened sometime in the 16 th century between Russia and china. I think the remains of one of the huge ships said to have taken part in the Chinese expedition was recently uncovered. I shall re read the book with interest in the light of recent discoveries and increased knowledge. I just read pages beginning at 347 about circumnavigating Greenland possibly 180 miles from North Pole. Index has pages about Antarctica. There was a dispute by cartographers about authenticity of mapping in the area involving type of ink. All interesting from a different angle than when I read it more than 10 years ago. The book you refer to is mostly speculation. Very interesting and perhaps even true in part. But speculation. Your opinion appears to be just speculation and not interesting and not likely true in any part. You could be right Mr Pope. And it has been several years since I read it. I recall it was similar to Jared Diamond’s style. Diamond’s books are very interesting reading, but light on actual evidence to back up many of the leaps he takes. But sice you recommend it, I’ll take another look. I read that book a while back, too. Wasn’t entirely convinced. But here’s an example of an orthodox denigration of the idea. Typical paradigm defense. From that site there’s no way to know whether the idea has merit or not. Genetic studies have come a very long way since that book was published. Already, in 2014, evidence of ancient genetic contact between South America and Polynesia was published. Unfortunately, this is hardly proof that Gavin Menzies is right. The issue of pre-Columbian transport of crops could easily be explained by occasional voyages, or even wind-blown wrecks, by Polynesian or South American adventurers. At our current stage of genetic analysis, it should be possible to determine the provenance of early (Ming) New World crops, in terms of their South American relatives and probably even the time of divergence. The question of genetic contact among humans should also be falsifiable at our current state of technology. Here we go again with that nonsense about Tambora in 1816. The number of times people point to volcanoes drastically affecting the climate for sometimes a number of years without looking at the weather PRIOR to these events is legion. Lest anyone forget, just a few years previously 1812 (non volcanic) had caused devastation to Napoleon. Prior to 1816 there had been a long run of bad weather. I find such anti-narrative fact interesting…but it publisheth no papers. It is extraordinary that respected researchers can focus on 1816 and not think to look at the years that preceded it so it could be seen in context. It is difficult to see any influence at all from Tambora in 1816 . Similarly Michael Mann wrote a whole article constructing some complicated hypothesis about the volcano of 1256 but again it was merely one of a number of bad years, albeit for a few months it got especially bad. Tonyb, 1674 was a year without a summer and without a volcano. The legendary winters of 1607-8, 1683-4, the all-Europe freeze of 1708-9, the disastrous cold+drought of the early 1740s…these are not easily explained by big blows. You can maybe tie the cold of the 1780s to Laki, but how do you explain all the rest of the later LIA? The major known eruptions of the 17th and 18th centuries don’t coincide neatly with the major cold waves. And we know that in 1813-14 the supposed chicken of cold came before the supposed egg of volcanism. The animation gives an impression that the amount of water in the oceans changes. In many instances the whole sea is blue (meaning raised level), but where is all that water comming from? From the areas of the ocean where gravitation/rotation used to retain it before there was a change in gravitation/rotation that let it to flow to wherever the emergent gravitation/rotation regime is influencing it to go. The “cumulative” rise nearly disappears every April and emerges every October. Grace measures the total mass between the satellite and the center of the earth. Sea level is inferred from mass. I do not believe it can be meaningfully corrected for salinity…yet. Say what? Seasonal isostatic rebound? And this also explains the “drop” at the mouth of the Amazon? What about fresh water just being less dense? Perhaps, formation of sea ice NH winter; melting spring to September. Complicated stuff. Highly dependent upon the assumptions applied to collected data as corrected for hypothetical geoid. Same sources produced the recent analysis of the change in Earth’s “wobble” around the axis of spin. Calculated that a key element contributing to the shift was surface and groundwater depletion around Caspian Sea and Indian subcontinent. Despite fact that volumes (compared to polar ice melt) removed (or added) there are relatively low, changes in mass closer to the equator (around 45 degrees latitude) have a greater effect on the wobble, gram for gram. The discovery raises the possibility that the 115-year record of east-west wobbles in Earth’s spin axis may, in fact, be a remarkably good record of changes in land water storage. Interesting. Papers have different estimates, but the latest GWS paper showed net storage, not net depletion, so redistribution of groundwater on the continents is what matters? For the wobble, it would appear so. This may relate to length of day issues, as well. 800 thousand years of Antarctic Ice Core data, much from warmer times than now, indicate that the current climate cycles are just repeats of past cycles, nothing new and nothing more threatening than cycles of the most recent ten thousand years. Ice core data shows that the ice is replenished during the warm times, then ice advances and makes earth cold. Ice core data shows a lack of ice accumulation in cold times, the ice depletes and retreats and makes earth warm again. These are normal, natural and necessary cycles and we did not and are not and cannot cause these cycles or major changes to these cycles. These facts are in the ice core records. The linked (above) article in turn links to a paper (from 2013): Bioflocculation: Chemical free, pre-treatment technology for the desalination industry which describes the process which is coming on-line to produce Israel’s “extra water”. And a presentation: Seawater Desalination Energy Consumption Calculation Model that I haven’t tracked down the software for yet, or even decided whether to. But it looks interesting. Supposedly, 300 million people get their water from desalination. Which raises this point: currently, groundwater mining is a contributor to SLR. Presumably, more and more will turn to ocean water desalination as ground water is expended. Will desalination begin to subtract from SLR in the future? Well, a lot of it should go right back to the oceans. To stop anthropogenic subsidence, Tokyo address using groundwater for its water supply. True. But it appears as if ground water extraction may peak sooner than we’d imagined. Wall Street Journal on Pumped Storage. WSJ should have interviewed CPUC. In mandating grid storage, they expressly ruled out the porposed Eagle Crest facility by requiring that no more than 30% coild be transmission connected. Eagle Crest would use two abandoned open pit iron ore mines, and is less than 10 miles from an existing transmission corridor. Essay California Dreaming in Blowing Smoke. Sounds like science is systematic oppression, at Brown anyway. I guess Mann – like me – is just some kind of thing. I’d like to see a Brown graduate invent the internet, antibiotics or solar power cells without quantitative data, statistical information, and documentation through written word. The Climate Audit commentary on Gergis is stunning. First her article at Conversation is simply false. She knew McIntyre had the FIOA proof, and yet published the lie anyway. Second, IPCC used the withdrawn then relabeled stuff proven faulty. Finally, four years later after significant illogical data torture they produce a similar result. A clearer example of bad climate science could not be imagined. A clearer example of bad climate science could not be imagined. What “science”? It’s out-and-out propaganda. She knew her target readership would believe her claims over McIntyre’s, even when he had the emails to prove his. With so much data torture by Gergis, et al, I wonder if they are aware of the Geneva Conventions? Modi’s pledge to cleanse the Ganges isn’t just about metaphor, or religion, or stripping off the mask to reveal the dark side of his Hindu nationalism. It goes to the very heart of his appeal. Nothing sums up the failures of government in India better than the despoiling of the Ganges. Rajiv Gandhi vowed almost thirty years ago to clean it up. Since then, hundreds of millions of dollars have been squandered on his Ganga Action Plan, with no discernible results. Hawkins paper on matching models and reality. IMO a pretty big fail. Especially given figure 2, a portrayal of how poorly model temperatures (not anomaly) agree with each other and reality. Acrual,temperature has a lot to do with water phase transitions, evaporation, humidity, and cloud formation. And therefore with model sensitivity. To declare it unimportant and switch to anomalies hides this truth. Fretting about which anomaly baseline best matches models to reality is a distraction. Christy’s comparison of all CMIP5 to satallite and balloon records shows almost none of them come close to matching reality. What a great example of the effect of better technology on the concept of “detection bias.” I’ll be adding it to my future Johnologues on the subject. Thanks. Dr. Curry. I love this weekly feature of your blog. ‘In our unquenchable desire to search for truth we often do not notice things that nature warns us about’. So when in Rome think as the ancient not the contemporary Romans do. That’s quite an impressive correlation. I have to admit to not paying attention to the issue in the past. That will change. a)	Correlation is negative (inverse), i.e. the GMF values are plotted in reverse order. b)	GMF leads the GT by number of years, here GMF is moved by 5 years along x axis..
After watching the Brown U video and reading the story about the grad student finding the error in the cons vs. libs social “science” (quotes pejorative) research .. .I’m going to take a shower and congratulate myself for dropping out of college. Verhulst, Hatemi, Martin psycho paper shows up the peer-review system… again. 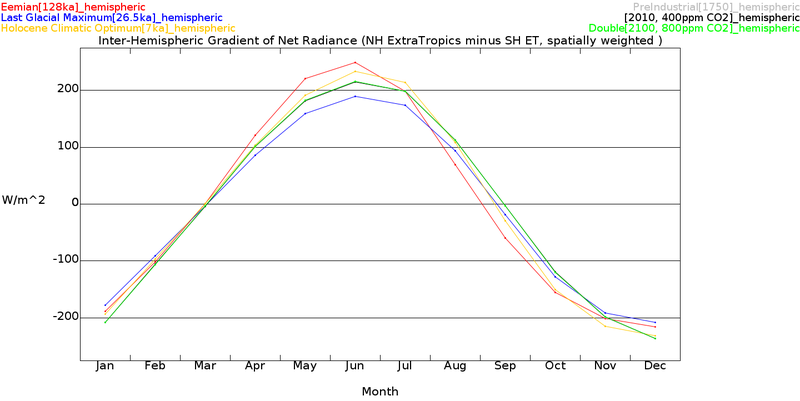 La Niña looking less likely… where have heard that before? The OHC numbers will be out soon. Another El Niño could be in the offing Spring 2017, and maybe two more warmest years before 2020. The church of the AMO believers have disrespected the PDO, and he’s one angry barroom brawler. That’s quite a range on predictions. What skeptics require… have to have… is the resumption of of the Kimikaze… the divine global kooling wind… named after kim. At times it appears as if Nature is a skeptic. Specifically, tropical Pacific variability amplifies the first warming epoch of the 1910s–1940s and determines the timing when the big hiatus starts and ends. Our method of removing internal variability from the observed record can be used for real-time monitoring of anthropogenic warming. You can forget about nature being a skeptic. The 30-year cooling phase started in 2006 and ended in 2014, and barely did a thing. So again, we may not see the mid-century cooling pattern in the GMST for the entirety of the rest of this century, and you can forget climate sensitivity being low. It ain’t. You can forget about nature being a skeptic. She’s not skeptical that global average temperature is rising. She’s skeptical that global average temperature is significant in any way. To all intents and purposes it appears to be non-existent. Here, surface air temperature from twenty climate models is analysed to estimate the historical and future likelihood of hiatuses and “surges” (faster than expected warming), showing that the global hiatus of the early 21st Century was extremely unlikely. A novel analysis of future climate scenarios suggests that hiatuses will almost vanish and surges will strongly intensify by 2100 under a “business as usual” scenario. For “CO2 stabilisation” scenarios, hiatus and surge characteristics revert to typical 1940s values. JCH The church of the AMO believers have disrespected the PDO, and he’s one angry barroom brawler. MM – see if you can see the PDO govern the 1910 to 1940 warming, the mid-century cooling, and the 21st-century pause? And just to be clear, I do not think the PDO and the AMO are cycles. They are more like thermodynamic guests that come and go… and may stay or never come back. Congrats if your predictions turn out right. No one can say you didn’t warn us. “Alpaca, the quintessential word in warmth and luxury, these furry animals are dying because of the…cold. How can this be? How can a creature who has endured cold at high altitude for thousands of years now perish? Perish in, what climate scientists and President Obama supports with Government money, global warming? We are told the world is headed to a hothouse where the human species will fry and become extinct. We are scolded if we do not listen to the sayers of doom and gloom; they say it, must not it be true? Alas for the Alpaca, global warming has come too late. Or, and this view is somewhat controversial, that global warming is a manufactured alarm, when in fact, the globe warms and cools naturally: ice ages and interglacial periods come and go. To persuade the multitude, it seems that observations by climate scientists are being discarded for the magic of computer model output. The Alpaca dying is real. The computer models predicting unbearable warming must surely be wrong. Thank you for the June 2016 global temperature map. I noticed the cold in Argentina, Paraguay and a portion of Chile, however, the article describes Peru, on the Pacific Ocean, just South of Equator and in particular San Antonio de Puntina. No particular cooling in the area described; maybe a touch warm anomaly. The author of this piece, Franklin Bricenio may have wished he would have visited the area as he would have found that much of the children’s respiratory illnesses was due to indoor air pollution from burning biomass. And, he may have noticed that the grasslands were covered with Alpaca and sheep, altogether harvesting both summer and winter forage at the same time. Death due to overgrazing. Animal husbandry may need an update in them thar hills. Of course, I am probably not being fair to Mr. Bricenio as the ascent to 5,000 meters may result in a confused mind from high altitude sickness. RiHo08 – those maps don’t have that level of precision. Nick Stokes has a tool on Moyhu which shows it with more precision. Observations show a long-term decrease in drought conditions over So. Great Plains. 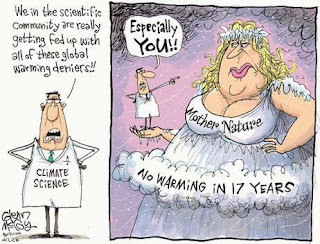 Climate models? Not so much. This is not surprising to me. Precipitation events are discrete and multi-factoral. And weather. What hubris was it that anyone thought that climate models could predict precipitation or drought to begin with? Harvard paper on climate uncertainty. There are three erroneous assertions in the abstract. 1. Uses AR5 ECS range, which really the reflection of the split between observational estimates (low) and model estimates (high). Problem is, the models are also wrong in other ways. 2. Asserts marginal costs rise rapidly with temp. That is not true with crop yields; many of those papers are just wrong (see my very first guest post for an example). Other papers say there are marginal crop benefits for the first 2C warming. That is not true with SLR because of ice thermal mass. See last guest post concerning the Eemian. It is not true concerning weather extremes because IPCC SRES found weak to no couplings. 3. So uncertainty raises expected value of climate costs? Bad math. Expected value is sum of all P(x) times C(x). In fact, P(x) is high with observational sensitivity and low with model sensitivity. And marginal costs do not rise that much with T.
A faux rejustification of the ruinous precautionary principle. As bad as Maugerie’s paper on oil, coming from the same Belfer Center. See guest post Oil Isn’t the next Revolution. “A different approach. 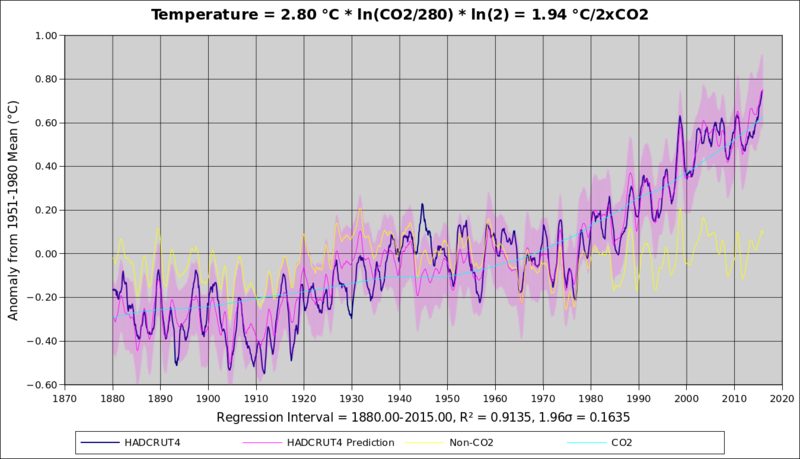 Estimating trends in the global mean temperature record. [link]” aka “Estimating trends in the global mean temperature record” Poppick et al is well worth a read for those that are interested in estimating CO2 sensitivity. Did so, but had a less positive reaction despite an anthropogenic ECS between 1.5 and 3, centered on 1.8. I found their division of anthropogenic and natural sensitivity suspect, because 2/3 of their data set is a period when ‘only’ natural could have been at work and the only temperature rise in it (~1920 – 1945) is statistically indistinguishable from 1975-2000. That does not argue for attribution 2/3 anthropogenic. Rather the opposite. 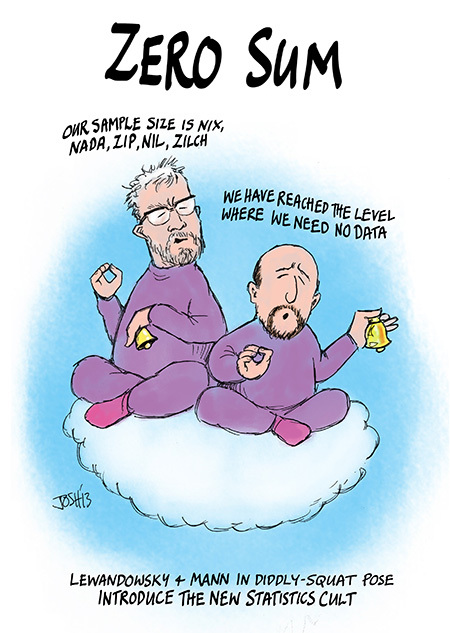 Also, their temp data set contained no pause. Finally, I don’t think historic forcings can be well characterized a priori– for example CO2 impact on radiative imbalance at TOA. Observations are sat era only, and inherently also involve all feedbacks. Just going to more correct regression methods to handle autocorrelation does not automatically give a better result. Anthropogenic has been at work since we started to grow rice. I think it is worth keeping an eye on the work that STATMOS is fostering based on the methodological improvements they are encouraging. Not to mention herding goats/sheep. Especially in the Sahara. Put me down as goat herders started populating the Sahara because it became rainier and greener, and then stopped when it stopped raining. During the Last Glacial Maximum, the ITCZ was more constrained ( both northward and southward ). By comparison, the radiative effect of doubling CO2 is irrelevant. One of the most fascinating aspects of the African Humid Period is its impact on North African human sustainability and cultural development ([ref’s]). North Africa was nearly completely vegetated during the height of the AHP ([ref]) and populated with nomadic hunter-gatherer communities that increasingly practiced pastoralism (husbandry of cattle, sheep, and goats; [ref’s]). The rock art images in Figure 1 depict impressions of this life. Towards the end of the African Humid Period between 7,000 and 5,000 years ago the progressive desiccation of the region led to a widespread depopulation and abandonment of North African sites. These populations did not disappear, however. The large-scale exodus was coincident with the rise of sedentary life and pharaonic culture along the Nile River (a perennial water source) and the spread of pastoralism throughout the continent (Kuper and Kröpelin, 2006). The thing about herding goats (and often sheep) is that primitive nomadic cultures tend to go through booms and crashes, with consequent effects on dust generation. Much of that dust makes its way over the Atlantic, some of it to the Amazon. In both locations changes to it have the potential to make substantial contributions to climate change (via fertilization). Some mechanisms might be via CO2 (e.g. changing the balance between diatoms and coccolithophores), and others might not (e.g. changes to biogenic sulfur and other aerosols). Via one of the links I came over this little beauty. – From about 8:30 into the video clip. SoF, fascinating demonstration of rabid warmunist belief. The Bahama boulders are likely tsunami. We even know from where (Canary Islands) and about when. He acknowledges that hypothesis and brushes it off without explanation. There ismone superstorm paper on the Bahamas. It is weak, does not use boulders, and basically shows the dirty side of Cat 5 hurricanes have hit the Bahamas before. The sudden ice sheet collapse stuff is based on faulty science that in one case amounts to academic misconduct. Guest post By Land or by Sea. Several meters of SLR by 2100 is impossible, see most recent guest post here, plus the linked Tipping Points post. What is disturbing is that he seems so credible and earnest. But then, Bernie Madhoff seemed that way also. -Original paper stated it had used detrended temperature data to select proxies but actually hadn’t done so. Detrending would reduce the available number of proxies from 27 iirc to 6-8 – which of course the authors say didn’t affect the conclusions, is not material, etc. (Is there anything that could possibly affect the conclusions of a paper in climate science? No, because the conclusions are set in stone before the research begins). 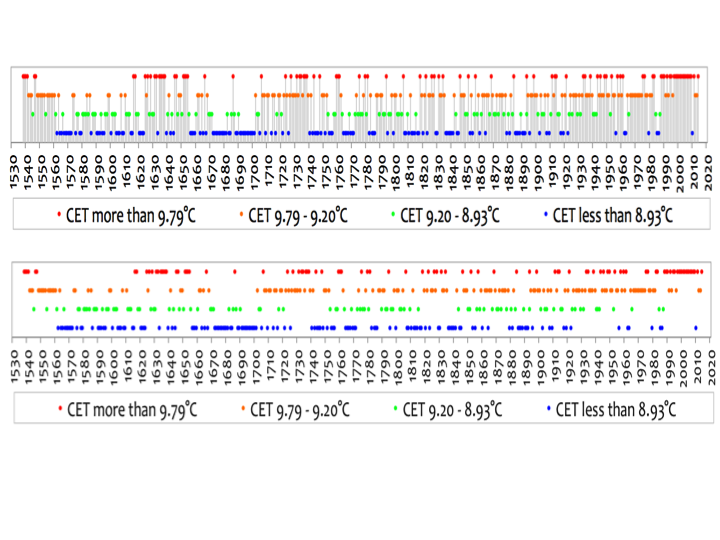 -To get back to the original number of proxies, Gergis and coauthors now select those that correlate with local temperature the same year, or the year before, or…. the year AFTER! That’s right, supposedly tree rings act as crystal balls telling you what next year’s temperature will be. -Proxy reconstructions have a calibration period (to test the relationship between temperature and tree ring width for example) and a verification period (to see if such relationship holds up). Gergis stated that it used 1901-1930 for calibration (true) and 1931-1990 for verification. Well turns out the verification in fact starts in 1921! So 1/3 of the ‘independent’ calibration period in fact overlaps with the verification period. -The proxy network, and reconstruction, is almost identical to that seen in the Pages 2k paper three years ago. What exactly are they getting paid for? And after publishing this **** she still has the gall to write in a website that she has been unfairly targeted and blahblah. Made a brief comment above. Agree with you. Shocking that she would do all this knowing McIntyre had the goods from FOIA. Rather like Mann in a way–oblivious to the fact that others can onjectively fact find and judge, and that those conclusions can be distributed worldwide in an instant for all to see. Just a quick note. Gergis et al used the 1921-1990 period for proxy screening and the 1900-1930 period for verification. In other words, you had the two reversed. Doesn’t change your point, of course. You can’t have “independent” verification when your verification period overlaps with the screening/calibration period. Think about how little room there is for natural variation in the theory propounded by the climate industry. re: “Updated map of the human brain hailed as a scientific tour de force” ==> this needs to be read in conjunction with the recent finding that all fMRI studies have used software that produces a 70% FALSE positive rate. The linked story omitted that scientists have come up with a handful of slightly more modern techniques with which to look at the brain, such as MRIs, resting-state fMRIs, and myelin mapping. Reminds me of Edward Hubble’s discovery that most of what we thought were nebula were actually other galaxies. These new brain maps improved ‘resolution’ by several orders of magnitude. The use of AI software to illuminate very discrete areas of brain activity was a neat twist! Mean while the news is out that the Chinese are going to use CRISPR to edit human genome in live subjects. This is amazing stuff. Cows are worse for the planet than cars: Ride-sharing services like Uber and Lyft are doing more to reduce carbon dioxide (CO2) emissions than government green mandates, according to a three-year study by scientists at the University of California, (UC) Berkeley. ” He kept a miniature, stainless-steel working model of it in his office. “I could put vegetable oil through it and get a cup of the most beautiful biodiesel you ever saw,” Harvey Greenwood, Green Diesel’s former director for engineering, says of the model. Green inductivists in a nutshell. That’s a near perfect temperature for life. Now what was the average temperature of the tropics at that time? 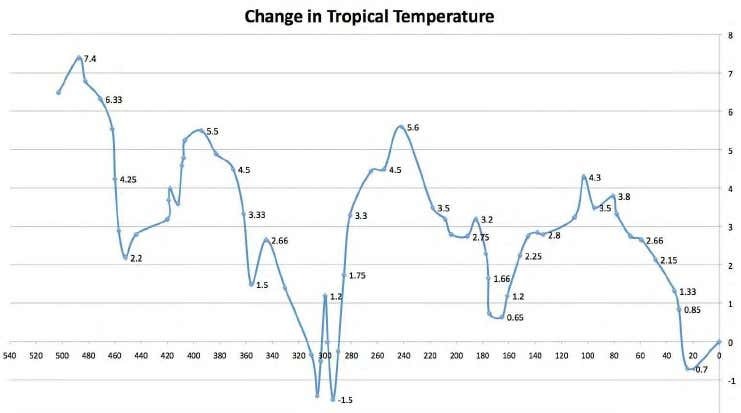 This chart tells us the average temp in the tropics was about 2.7C warmer than now. That was 65 million years ago. What could the average temperature of the tropics realistically change by in 100 years? And what would be the consequences of that to the global economy? What is the evidence (not inuendo And cherry picked factoids – I am asking for the total damage function and the evidence to support it)? Insulation?? This greenhouse gas effect has so many definitions, so many heads, like monsters in Greek Mythology. My house is insulated to keep it cool. A little more insulation would make it a little cooler. As does increasing the insulating effect of the atmosphere. Moon hot. Earth cool. CO2 good. No CO2 very, very, bad. Insulation doesnt cool your house or warm it. It keeps your house warmer than it would be otherwise in the winter..
in the summer it keeps you cooler than your would be otherwise..
At the same time Steven, the Sun, is closer in the Summer & the farthest away in the Winter… It is not because of your heat pump. That is the thing that helps you regulate the outdoor conditions you will be facing at the time. Sun is closest during Northern Hemisphere winter. Precisely. As does the atmosphere. Cooler in the sunshine, warmer in the dark. Is it not so? What I cannot understand is the insulation effect of 2 ppm increase in the concentration of CO2 annually. They are very simple engineering calculations, where are they? My numbers show zero increase in insulation effect. This claim is no different than the greenhouse gas effect- both are groundless. What I cannot understand is the insulation effect of 2 ppm increase in the concentration of CO2 annually. They are very simple engineering calculations, where are they? 3) the theoretical annual rate of change is well inside the error estimates of the observations. My numbers show zero increase in insulation effect. This claim is no different than the greenhouse gas effect- both are groundless. Venus and the Moon empirically disagree with you. So does the theoretical work by the likes of Planck and Boltzmann. Less celebrated in popular culture, but no less important, are the works of Pierre Bouguer, Johann Heinrich Lambert and August Beer on the attenuation of electromagnetic radiation as it passes through an absorbing medium. Insulation. Finally I get it! CO2 is insulation in the atmosphere. That means, when I insulate my home, going from R-5 to R-12, I get a boost in my home not cooling as rapidly during the winter. And, I can get money from the Government for insulating my home. One of the problems with such a construct seems to be when going from R-12 to R-15, I don’t seem to get very much more benefit from the added insulation, and, what’s worse, the IRS guy who took a peek at my deduction for further insulation on my home, says that such added insulation doesn’t qualify for a tax break. Hmm, does the IRS know something about the worth while ness of extraordinary insulation that popular climatologists don’t know, or, are they just not saying? What about going from R-15 to R-20, a liquid nitrogen thermos flask kinda insulation, keeping my hot coffee hot for 8 hours instead of 5 hours. The more insulation, i.e., the more atmospheric CO2, the longer the atmosphere should keep things warm, unless of course, there are other factors in play, such as my keeping the lid off my Starbuck’s coffee thermos. Then, instead of a closed system, there is an open system and no matter how many “R’s” of insulation I have around my thermos, if I forget to close the system, then, cold coffee in less than an hour. Do I have the insulation story correct? You are way off on a tangent. We are talking about insulation effect of CO2, a new definition of greenhouse gas effect. In order to have insulation effect, there must be a decrease in thermal conductivity of the atmosphere, increase in the thickness of the atmosphere, or both. There are no other variables. With 2 ppmv rise of CO2 annually, There is no change in thermal conductivity. The thickness of the atmosphere is decreasing for geopotential heights are decreasing based on observations. Where is this insulation effect? There should exactly the opposite based on the science. There is a saying “a drowning person clings to anything including ropes of air.” I think it is the case for proponents of the greenhouse gas effect. They would go by any explanation as long as it saves the day. I heard of CO2 trapping heat as a wall, radiate heat as ceramic tile, vibrates energy as a spring, and now acts as insulator of the surface. The list probably is not complete yet for we do not know how many heads this monster of greenhouse gas effect has. The two statements are contradictory. Melting of glaciers submerged in the sea will not increase sea level. On the contrary, it will decrease sea level. Remember this is not sea ice, the glacier is not floating on the sea. The specific volume of ice is 1.09 cu.m./MT while liquid water is 1.00 cu.m./MT. If you melt a ton of ice, you create an extra volume of 90 liters. What’s the effect of extra volume? Thought experiment: Fill a thin glass with water. Get a fat glass (greater volume) and transfer the water to the fat glass. The volume of water is the same but volume of glass increased. Will the height of the water increase or decrease? The Laurentide ice sheet in North America in the last glacial period was not submerged under the sea like the melting glacier in Antarctic Peninsula. The Laurentide ice sheet was on top of the Great Lakes. Did you read the article? Let me repeat it for you: “glacier melt actually lies deep in the ocean – several hundred metres beneath the surface.” Where’s your brain? Her brain looks bigger than Bill’s. Or is this the cover of a new book for children? The hole world is a pattern. You’ve bet on Doc Strangelove’s brain. In your lost brain, CURRENT means 18,000 years ago??!! Basic picture. The ice was grounded 25,000 years ago. The shoreline was a long way away. 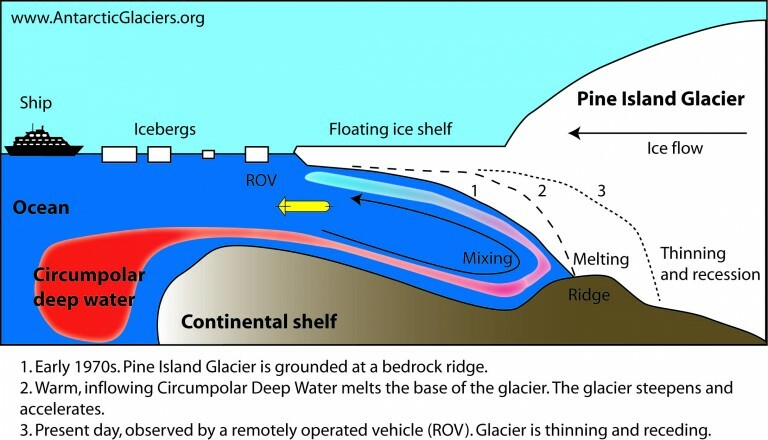 As the earth warmed, sea level progressively rose and eventually the grounded ice that is situated between the two shorelines in the picture was completely melted. And? Starts using RCP4.5 as the reference case for simulations. There’s a need to establish a standard reference where RCP4.5 fossil fuel burn rates, emissions, and concentrations are compared. This way, if we see that RCP4.5 was a more reasonable projection, we can move the crystal ball economics industry to a comparison between RCP4,5 and the COP21 and other government policies. I think you’ll see that if a case closer to RCP4.5 becomes the reference, the economic gains from additional emissions reductions are not worth the effort. I have even seen model results which predict faster sea level rise for lower emissions options. 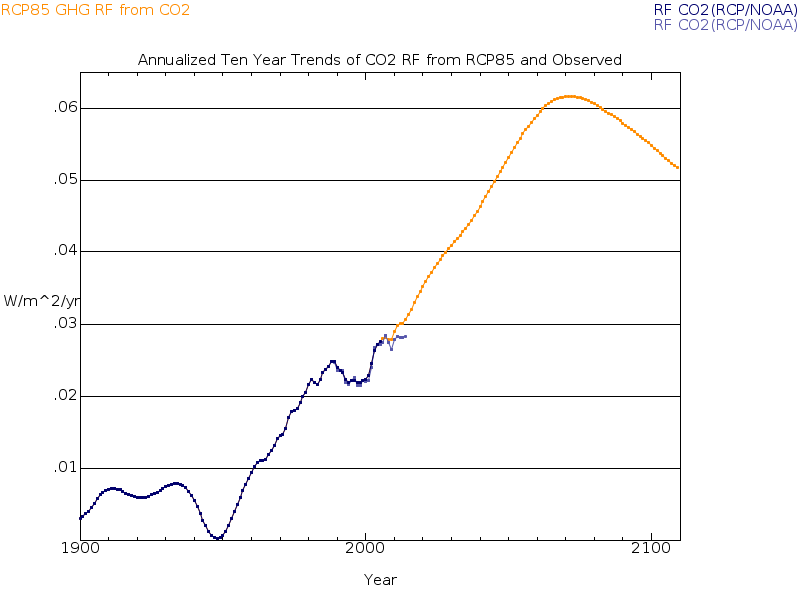 RCP85 exhibits peak rates of CO2 forcing around 2070. Observations, subject to the future, may have already peaked in 2007. TE, i go further back into the asumptions used to create RCP8.5 and other cases. What perked me up was the incredible oil production rates, which aren’t supported by any real numbers. Later, as I dug into the RCPs I realized they also had natural gas and coal discrepancies. The projection just doesn’t make any sense. The economic models which attribute X benefit to emissions reductions are based on cut backs from RCP8.5. As you can imagine, these benefits aren’t real if the “BAU” exaggerates emissions and concentrations. If the forcings / climate sensitivity are also diverging then this confirms the whole IPCC AR5 needs to be reworked. I’m more worried about energy shortages from excessive dependence on volatile nations like Saudi Arabia, Iran, and Iraq. A nice graph. I did not know that we could measure the Earth’s energy balance with that precision. Link, please. The two quotes below are from the Harvard paper “Confronting Deep and Persistent Climate Uncertainty”. The two authors are notable scholars in economics and one also has credentials in climate science, and is the lead senior economist at Environmental Defense Fund. Do the quotes represent scholarly work expected from these two gentleman, or do they represent yet another reason for Rud to withhold donations from Harvard? Another reason to withhold donations. “Most of what we don’t know would push the number further still …” is an astounding claim. Make that an absurd claim. The second quote is garbled. If it is historic, reporting what consensus has said, then it is true, but so what? If predictive, telling us what to expect, then it is merely the usual consensus speculation, hence not to be believed. EDF econ for sure and Harvard tends to be a silly school. If we currently can’t even model a mob of mice, why are we still playing with the future of some kids global climate conditions? At last we will all be able to breathe easy in 2041. Of course we will have just survived 2035, so light another candle for ‘science’. Duh, if you use the “expert” advice and replace fossil fuel and nuclear fuel with Wind, Solar and Ethanol, the disaster will come sooner than that. If we continue to use fossil fuel, including coal, and nuclear fuel, we will never run out. Either way the climate temperature and sea level bounds will proceed using the natural cycles. As it gets warmer, they system approaches an unknown limit. Upward excursions involving near vertical slopes, now collapse sooner than before. If the shape of the 3 El Ninos are thought of as probability distribution functions, perhaps some unknown has changed in a warmer world, changing what an average El Nino will look like. Ragnaar – can’t see your graphic. NODC OHC through June is out. Could someone please tell me what is the global economic benefit or damage of a change in atmospheric CO2-eq concentration (e.g. US$ trillion per 1% change in CO2-eq) – and provide authoritative sources that show the basis of estimate and the assumptions. If we don’t know this key paramter that is essential for rational policy analysis, I suggest there is no rational basis to argue for GHG mitigation policies. The fantasy IAMs can easily generate those numbers. You can roughly estimate them from the SCC fantasy damage per ton numbers. Just guess the number of tons per % increase and multiply. These absurdities are no basis for policy making. There may be no damage at all, or even net good. David. The IAM’s do not define the damage function. They are an input to them. Economists and researchers have to do the research to estimate how much economic benefit or damage a change in global average temperature would cause. I’ve gone one step further back. I want to know the damage function for a change in atmospheric CO2 concentration, because like you, I do not believe that CO2 emissions are a significant threat. Usenet easter egg GKKjqp09MJz in alt.binaries. Loved the bad science paper. And yes, the author gets it right. It is clear that Hatemi and Verhulst are sub par at best and (particularly in Hatemi’s case) dicks. They actually make Lewandowski look good in comparison. One of the blogs I’d regularly check is Isaac Held’s. Ding dong, the pause is dead. Following the approach of Fyfe et al. (2013) where inter-model spread is used to assess the distribution of trends, but using the fixed-intercept trend metric, demonstrates that recently observed trends in global-mean temperature are consistent (p > 0.1) with the CMIP5 ensemble for all 15-year intervals of observation-model divergence since 1970. Now we know how you spend your time. Enjoy. The biggest problem with that paper, IMO, is that the chronology of the entire West Asian LB/IA transition has been well challenged by James, et al. The “consensus” dating of the “fall” (if any) of the “Minoan” civilization is about as reliable as the “consensus” opinions regarding “equilibrium climate” effects of CO2. 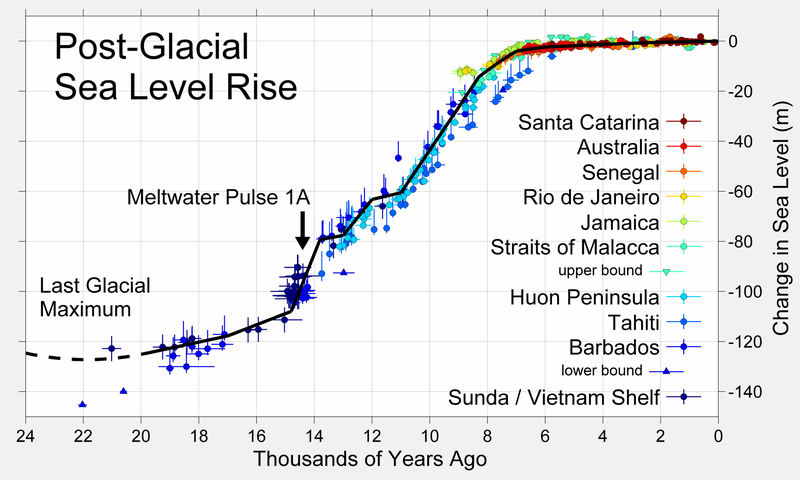 The biggest problem is in getting people to see that the very warm spike in GISP2 around 1200 BC was one of the most severe cold/dry periods through the Holocene for the mid latitudes. Thing is, there’s not really any good evidence of a “collapse” at all between LB and EIA. Of course, that doesn’t mean that a non-collapse transition couldn’t have been driven by those climatic changes. But the traditional dates for EIA would also apply to “LB” if James et al. are correct. They propose an overlap of perhaps a couple centuries, relative to the “consensus” chronology. Of course, Finkelstein (etc.) is solidly part of the “consensus”, the way that Trenberth, for instance, is part of the Klimate Konsensus. OTOH, the whole Middle East has multiple problems synchronizing carbon-14 dating with 20th century chronological myths, complicated by the issue of multiple answers for some time periods. Grimspound is one of the most famous sites in upland dartmoor in southern England. How do they know it was then? I couldn’t find any references to carbon 14 dating for Grimspound, and most of the chronology appears to be based on early 20th century tradition. Anyway, AFAIK artifactual cross-dating between England and the Eastern Mediterranean is tenuous, and highly dependent on third-hand links. So even if they have the dates right for Grimspound, that doesn’t say anything (much) about Middle-Eastern chronologies. Dartmoor is one of the most studied upland areas in the world as it has numerous bronze age and medieval artefacts. There are many books, papers and a dartmoor study centre in exter, ironically in the same building as the Met office archives. Dartmoor is one of the most studied upland areas in the world as it has numerous bronze age and medieval artefacts. Egypt is one of the most studied areas of the world at all, and James et al. are suggesting that its chronology is all messed up. For that matter, ironically, at least one reference is dating Dartmoor’s bronze age to about the same as James et al. would date the LBA (including Sub-Mycenaean) in the East Mediterranean. They run it a couple centuries into what is clearly Iron Age in the Aegean and Middle East, but it actually gives a better timing for cultural diffusion than the traditional chronology. 1-2 centuries as opposed to 4-5. There are certainly some issues with James’ et al. chronology, especially for the MBA. As Tsonis et al. point out, there is very good evidence for a high date for the eruption of Kallístē. 1628 or so. OTOH, there is very good evidence that, contra Tsonis et al., the destruction layer in the Minoan palaces (LM1A) can be roughly synchronized with that eruption. This presents a problem, as Colin Renfrew pointed out in the forward to James et al. Whatever the solution, any effort to explain the evolution of the “Minoan” civilization with reference to a prolonged drought from ~1450BCE to ~1200BCE needs to recognize the tentative nature of both ends of the archaeological chronology it’s working with. The end of the Minoan civilisation is contemporary with the Langgut et al collapse that I linked to above. Paleoclimatology requires a lot of imagination: A drought brought the end of Minoan civilization, whose ruins were subsequently covered with volcanic ashes from an eruption which happened three hundred years earlier. Is it good enough for a tenure? A drought brought the end of Minoan civilization, whose ruins were subsequently covered with volcanic ashes from an eruption which happened three hundred years earlier. The “Minoan civilization”, sensu strictu, ended sometime around 1600BCE, after the destructive eruption of Kallístē (in 1628BCE). That end was marked by the burning (almost certainly deliberate) of most of the palace complexes, some destruction at Knossos, which was repaired, introduction of a number of new pottery styles, and the replacement of the Linear ‘A’ script, whose language is unknown, by Linear ‘B’, which appears to encode a language reminiscent of an early form of Arcadian Greek, or perhaps a common ancestor of Greek and Latin. It’s marked in pottery by the transition from LMIa to LMIb, or perhaps it occurred during the LMIb phase. The chronology of this culture, and the destruction/replacement layers until the Classical era, remain sub judice. AK, thanks – I thought that Minoan and Mycean were the same. Never too late to learn. Then the Langgut collapse destroyed Linear A people and Linear B took over. Tentative, as you say. Now I surely deserve a tenure. The civilisation began to decline around 1450 BC, continuing to around 1200 BC under Mycenaean occupation. Evidently the Thera eruption did not cause their demise. No, they are some 250 years apart. Linear B is from around 1450 BC, and the Langgut collapse is around 1200 BC. The civilisation began to decline around 1450 BC, continuing to around 1200 BC under Mycenaean occupation. Those dates have been superseded. The “decline” you’re referring to is traditionally the events involved in LMIb, which have been redated to around 1600BCE. The dates for the subsequent sequence are fluid, since the firm re-dating of the destructive eruption of Kallístē to ~1628BCE. For instance, in the sequence linked above.1450 is tentatively given as the date for transition from LMII to LMIIIa. There’s no evidence of any sudden “decline” at that transition, or any other after LMIb. Mycenaean “occupation” began in LMIb, around 1600. Evidently the Thera eruption did not cause their demise. The eruption of Kallístē (only called “Thera”=”fear” after its self-destruction, and if you want to be nit-picky, its current name is “Santorini”) is firmly associated with LMIb. (Likely the beginning, the transition from LMIa.) The deliberate burning of most of the palace centers is associated with mid-(or perhaps late-)LMIb. Unless you want to suppose that a single pottery phase lasted from ~1620BCE to ~1450BCE, which is ludicrous, the eruption and “decline” are both centuries too early for Tsonis’ climatic observations. Tsonis’ 1450BCE date is clearly intended to refer to the events of LMIb. Linear ‘B’ is from ~1600. The collapse Langgut et al., especially Finkelstein, refer to has traditionally been dated to around 1200BCE, but per James et al. should probably be lowered to perhaps 1050BCE. There is no good evidence for the widespread “collapse” referred to in that paper. Demise not decline, as that is what you have quoted. I doubt that there was much occurring there after 1125 BC. The likely scenario is a ‘super’ solar minima triplet, from around 1360 BC, 1250 BC, and 1140 BC. OK, if you want to be picky. Traditionally, the destruction of a number of palaces, such as occurred in LMIb, is considered a “demise”, but Tsonis et al. treat it as the beginning of a “decline”. Given that the the palace at Knossos was repaired and the subsequent phases showed great continuity with the previous LMIa, I would call it simply an elite replacement, which cannot necessarily be considered either. It’s important to remember that archaeologists, especially in and before the early 20th century, measured prosperity and “declines” by production of elite pottery. This isn’t necessarily consistent with more lifestyle-type measures regarding the general population. In addition, as James et al. point out, production measures depend on both the volume of pottery dug up, and the supposed length of the period. Starting with Evans etc., there was a custom of arbitrarily assigning each pottery phase a time of 50 years, which is unrealistic, and often gives potentially erroneous measures of productivity. OTOH, extending the period from LMIb through LMIIIc to ~1600BCE to ~950BCE would certainly offer room for a long period of very low productivity. IIRC there’s little evidence of any non-occupation at most sites in the eastern Mediterranean. There’s a transition straight from LB(III) to Early Iron with no sign of intervening abandonment. Given the different styles of both LB and EIA found in transitions at different points, this is best explained (IMO) by a political change accompanied by a change of preferred elite pottery from LB styles to IA (Geometric). There is no reason so suppose this change took place simultaneously across various sites. Rather than a “dark age” as suggested here, following James et al. (roughly) I would suppose that the entire sub-Mycenean/sub-Minoan sequences, which IIRC are found only in grave goods, were carried on as a traditional burial custom during the geometric period. Thus, the “decline” would be both a couple centuries later, and only in burial customs. The elite pottery used for living would have been geometric. Yet Langgut is based upon pollen rather than pottery. The new research, as well as the later synthesis in Langgut, Finkelstein, Litt, Neumann, and Stein (2015) Vegetation and Climate Changes during the Bronze and Iron Ages (~3600–600 BCE) in the Southern Levant Based on Palynological Records, are based on pollen, and carbon 14. I’m not questioning any of that. My point is regarding the correlation with cultures and pottery phases, based on traditional dates and led by Israel Finkelstein. I just don’t believe the issues identified by James et al. have been considered in these correlations, because I’ve never seen any sign that Israel Finkelstein has given them any notice. You’ll note that the other two authors of the paper you linked, Dafna Langgut and Thomas Litt, are much more focused on paleoclimate and botany. I’d certainly be interested in correlations or studies that do take notice of the issues James et al. have raised. Unfortunately, IMO, they seem stuck on trying to lower the date for the self-destruction of Kallístē (to considerably later than the obsolete ~1450BCE date), rather than accepting that their primary issues WRT the LB/EIA transition are separate from the issue of the 1628BCE date discussed by Renfrew (among others). But both of those issues work to totally disqualify the traditional dates for, at least, the entire Late Bronze, in the Peloponnese, Cyclades, Crete, Anatolia, the Middle East, and Egypt. The question is: what new correlations can be established with this new climate information and the unsettled dates for pottery and building phases? The hiatus made fools of a lot of really smart people, and here are some more reasons why. The battle between the blue cities and the rest of the country continues and the Left’s continued use of government scientists to make up the facts they need to keep pushing the hoax and scare tactics of global warming while declaring jihad on sceptics who they believe are too blinded by the 3-Gs — Guns’n Gays’n God — to go along with their Eurocommunist Utopia. Lamar Smith must have gone to the Naval Academy because he thinks he can stop the oceans with his SUBpoena .High tides could flood Naval Academy fixtures like Bancroft Hall on a daily basis by 2100, according to a study on sea level rise released today. Well, it appears JCH and I have something in common. We both go in for science fiction. The Sun article he links to is wrong on several levels. Then there is usual “based on model output” garbage which is needed to get a rise that is scary. Gee, the Bay and the Severn come right up to the edge of campus. It is simply amazing how the water magically stops. Or is it sea walls? I’ll be back in MD all next week. Will be driving right by Annapolis on the way to the beach. I’ll make sure to check if it is underwater. Comments like this just show how completely clueless you are. The Naval Academy completely disagrees with you. The midshipman of today don’t have the luxury of being ridiculous reactionaries. They’re training young people to be effective in the coming decades. The USGS and anyone else who understands the geology of the Chesapeake Bay region know that subsidence is causing more than half of the so-called SLR there. Shut down all sources of CO2 and the ground is still going to sink, just like Miami, New Orleans, Bangladesh and all the other hyped up catastrophic tales of CAGW. How many Annapolis grads do you personally know JCH? Completely irrelevant, and completely irrelevant. They are too conservative. My study shows it will happen by 2018. You really are smarter than those scientists. Good boy. Is this also going to happen to planets like ours by 2018? Why are subtropical low-level cloud feedbacks positive in climate models? We explore the possibility that low-level cloud feedbacks are positive because of the relatively weak rate of increase global precipitation and surface evaporation with global SST, which is limited to 2-3%/K by the radiative cooling rate of the atmosphere, compared to the 7%/K increase in specific humidity required to maintain boundary layer relative humidity with warming, which is determined by the saturation specific humidity via the Clausius-Clapeyron relation. …These results support the hypothesis that positive low-level cloud feedback is caused by the relatively weak rate of increase in surface evaporation compared to that of the saturation specific humidity in the boundary layer. Equilibrium climate sensitivity (ECS) to doubling of atmospheric CO2 concentration is a key index for understanding the Earth’s climate history and prediction of future climate changes. Tropical low cloud feedback, the predominant factor for uncertainty in modeled ECS, diverges both in sign and magnitude among climate models. Recently, researches based on observations and climate models have demonstrated a possibility that the tropical low cloud feedback in a perturbed climate can be constrained by the observed relationship between cloud, sea surface temperature and atmospheric dynamic and thermodynamic structures. The observational constraint on the tropical low cloud feedback suggests a higher ECS range than raw range obtained from climate model simulations. Reconstructions of historical climate changes indicate that surface air temperatures decreased over the preindustrial last millennium. Conflicting explanations have been proposed for the cause of the transition from the Medieval Climate Anomaly (MCA) in the early part of the last millennium to the Little Ice Age (LIA) near its end. The possible causes include volcanic emissions, total solar irradiance (TSI) variations, greenhouse gas concentration fluctuations, and orbital forcing variations. In the present paper, it is demonstrated that all of these climate forcings contribute significantly to simulated surface air temperature (SAT) and sea ice concentration changes over this period. On the other hand, simulated ocean heat content appears to respond significantly only to volcanic and TSI variations. Does CO2 trump TSI? Perhaps the score is 1.5% to 1%? Oceans not withstanding. why won’t you admit you have no valid answer to my questions? Is that honestly so difficult for you?